An usher will greet you with a worship folder and a smile and help you find a seat. A short trip up the stairs just past the fireplace will take you to the back of the church sanctuary. If you have difficulty navigating the stairs, an elevator is available to the left of the fireplace. 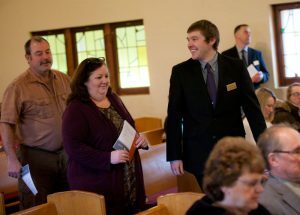 At the back of the church sanctuary, an usher will greet you with a worship folder and a smile and help you find a seat. There are no assigned seats at St. Matthew’s. Feel free to sit wherever you will be the most comfortable. We use a number of different orders of worship at St. Matthew’s, and they can all be found in the red hymnals or blue worship supplements in the pew racks. All of our services are also projected on a large screen in the front of the sanctuary. Our members dress in a variety of ways, from suits and ties to jeans and polos. Come as you are. We aren’t worried about what you’re wearing. While we encourage families to worship together during our services, we understand that small children can grow restless and parents may need to take them out of church occasionally. The fireside room offers a live video stream of worship, which allows adults to participate in worship outside of the sanctuary. For additional privacy, a cry room is located on the lower level. There are also changing tables on the lower level in both the women’s restrooms and the cry room. If you have questions or need assistance, our usher teams are equipped and eager to assist you. Or, you can contact us online today. To learn more about what we teach, visit What We Believe.